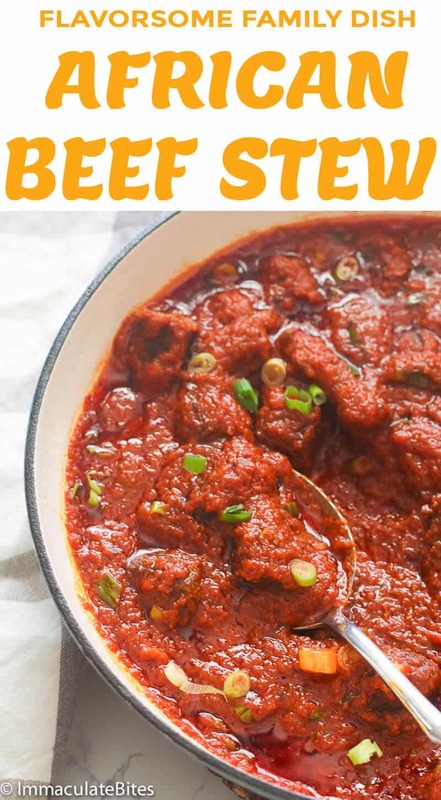 African Beef Stew – a popular mouth-watering stew and a traditional West African Stew that is often prepared in most homes, in a number of different ways. A must-have for Christmas gatherings and in everyday meal. 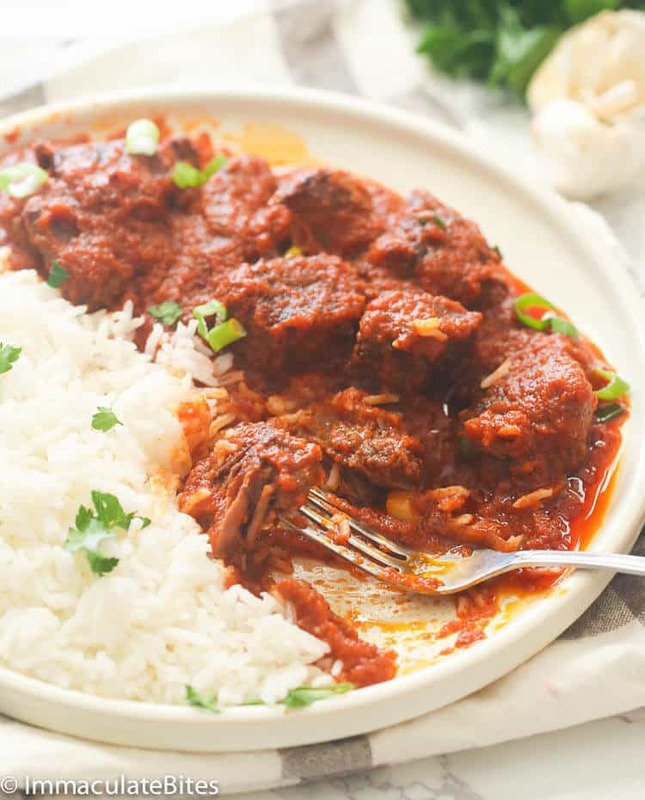 This is a popular and traditional West African Stew that is often prepared in most homes, in a number of different ways in countries like Cameroon, Nigeria and Ghana – by varying the quantity of tomatoes, onions and spices. Quite a lot of oil is used to cook the stew – often use to fry the tomatoes for a period of time to reduce the amount of acidity present in tomatoes. You know what? A good West African stew is flavorful and is rarely acidic. You may remove some of the excess oil at the end before serving. Rice and stew was once considered the quintessential West African Christmas meal. Of course, no Christmas table would be complete without it and an array of sumptuous dishes. Oh, how times have changed! This tantalizing beef stew has evolved into an everyday meal, cooked with different cuts of meat, and seafood and always present on restaurant menus. But to most people Christmas would never be complete without stew. 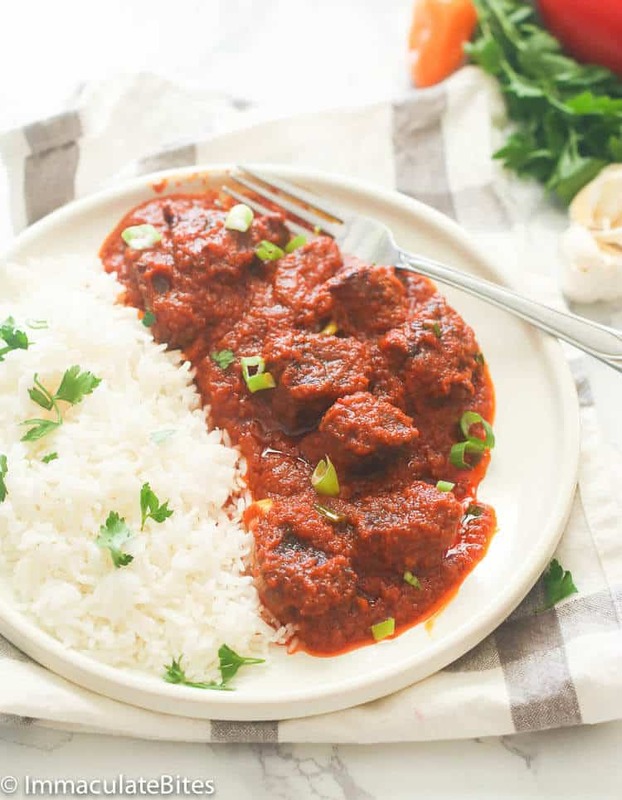 Here is my take on this mouth-watering African beef stew. Feel free to add vegetables such as carrots, green beans or green pepper. In Nigeria, it most often paired with African yam – fried or boil. 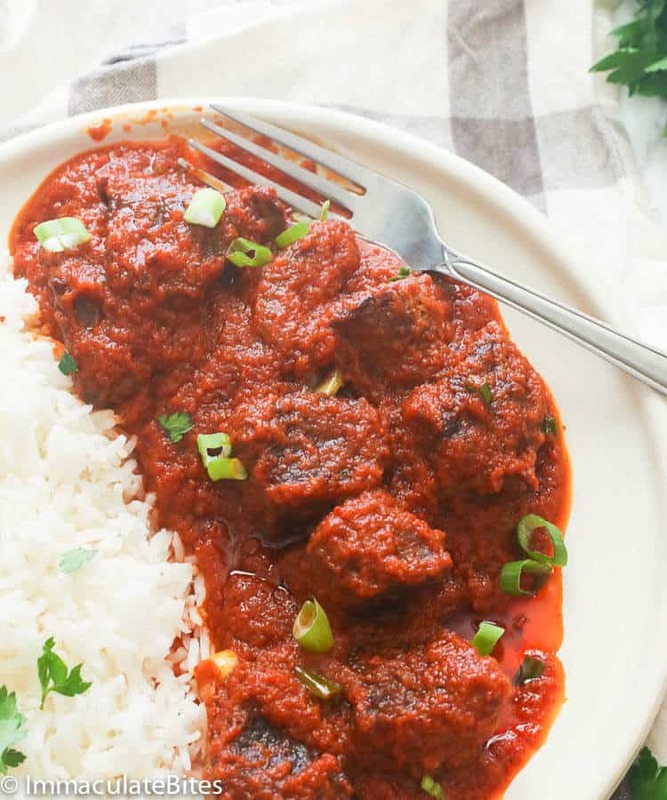 Rice and fried plantain is another good side dish option for this African beef stew. You can also let the meat simmer for about 3 hours for a fall-off-the-bones tender texture. You may replace canned tomatoes with fresh tomatoes but make sure you fry the sauce until completely dry before adding liquid. You might have to add more oil and watch out for burns. You can leave out the roma tomaotes; it works fine. If you don’t have beef cubes on hand, you may replace it with bone-in beef meat. Substitute Maggi powder with chicken bouillon. Recipe was first published on Feb 2014 and has been updated with new photos, tips and notes and a video. 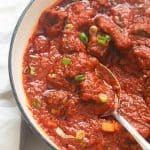 African Stew -- a popular mouth-watering stew and a traditional West African Stew that is often prepared in most homes, in a number of different ways. A must-have for Christmas gatherings and in everyday meal. Boil beef with salt, pepper and some chopped onions in a medium pot until tender. It will take approximately 30 minutes or more, depending the cut of beef and how you like your beef cooked. I sometimes use the pressure cooker to shorten the process. Reserve the stock for later use. Add 1 cup oil to the pot/pan and brown the beef for about 5-10 minutes. Remove and set aside. 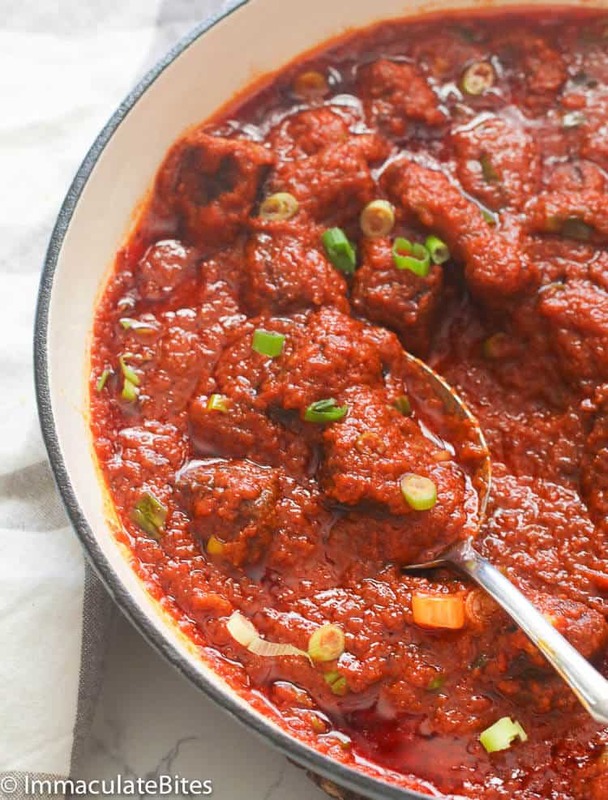 Gently pour the blend of puree ingredients, and tomatoes puree in the saucepan, add curry powder, white pepper , smoked paprika and bouillon powder bring to a boil, reduce heat and simmer for about 30 minutes. Then return browned beef and simmer for another 10 to 15 minutes. I just made this and it is delicious! Thank you for the recipe! My whole family loved it. This looks beautiful! I’m going to try it. You mentioned it can be made with other meats? Would I follow the same recipe if I made this with chicken? Can this be made in a slow cooker? If so what are the steps? I haven’t tried it in a slow cooker yet. So can’t provide you exact times and procedure. Glad it turned out great for you, Cynthia! I made this dish over the weekend and it tasted great. Thank you! I tried the African Beef Stew yesterday for dinner. Only issue i had was finding white pepper but other wise the dish came out excellent. Thank You for Sharing these great recipes! My pleasure, so happy to hear it worked out well for you. 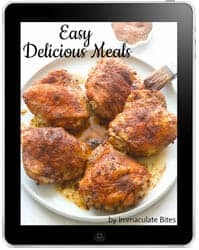 Excellent instant pot recipe. You may need to use corn starch mixed with water or chicken stock to thicken the sauce. Yaaay! Glad it was a hit. Thanks for letting me know. Hello Imma. This looks finger licking good. I can’t wait to try it. Hey, going to try this out. Have had a really nice beef dish which was cooked using tinned tomatoes from Nigeria – really nice smoky flavour. Just one complaint – there are at least three ingredients added in the process that are not mentioned in the ingredient list – smoked paprika, basil and green onions. Please do fix this as it completely throws people like me who work with a recipe until we have an understanding or feel for the dish. Thanks! Thank you!. Made it but ratcheted up the heat by going with six scotch bonnets. Reaaly delicious, fiery stew with a lovely tangy tomato base. Had it with crusty bread. P.S. i also used much less oil – perhaps 1/2 cup at the most and it worked well so maybe you can cut that oil amount down. Also, I used olive oil. I have a friend coming to America from Ghana is this something he will enjoy. I’m trying to learn how to cook African foods he will enjoy. For sure! I think he will love it !!! Just to clarify, is 1 canned tomato sauce the same as ketchup? Hi Rahman! No canned tomato sauce is puree tomatoes- with no extra embellishments. Ketchup would not be suitable in this recipe since it has sugar, vinegar in it. Thanks for pointing this out . It’s been updated . Please update the ingredient list to specify the type of onions, and how much basil. Also please specify when to add the roma tomatoes (I presume from you comments they go in the blender). I know I can figure things out from reading the comments but that’s not convenient. where is the updated recipe? Thanks! Hi Imma! This looks delicious and am going to try it out. Step #3 says to add basil in the purée but I don’t see basil in the list of ingredients. How much basil do I add? Thanks! Thanks! I made this the other day and it is delicious. So flavorful and aromatic. I let it simmer for 3 hours and the meat was fall-off-the-bones tender. Thanks for a great recipe! I tried some of your African Stew recipes and finally pleased my African husband. But my stew looks more red than those in your pictures. Stew that I know is more brownish and I like that way. Is that anything to do with tomatoes or oil..? Any idea? I would suggest replacing the canned tomatoes with fresh tomatoes . Canned tomatoes gives it that reddish color. Also make sure you fry the sauce until completely dry before adding liquid. You might have to add more oil and watch out for burns. Hello — this looks delicious and I hope to make it this week! I was wondering, could you substitute red onion instead of the roma tomatoes? Hi Ashley! Too much onion would make the sauce slightly bitter, go easy with it. My recommendation would be to make it without roma tomatoes, I do it all the time. Just have to cook for a few extra minutes . Please do let me know how it works for you. woww immaculate just tried your African beef stew and it has good taste. Maybe it would have tasted better if i added bay leaf. so which one is that plzz? Bay leaves are dried, fragrant leaves , sold in most markets depending on your neighborhood. You can google bay leaves images to see what it looks like. Hi Danielle! I like mine too with bone- Like you mentioned it adds more flavor to the overall dish. However, I usually use what I have on hand. A way to reduce the amount of fat (oil) without sacrificing flavor/flank is to cook off the water in the tomatoes by boiling the tomatoes until all the water is gone. Once the water cooks off, add some oil (olive oil works well) to fry the tomatoes. Doesn’t take long. Follow the rest of the recipe. Have done this several times without noticing a change in taste or flavor. The amount of fat and calories is significantly reduced. Yum! Hi Patience! Thanks for taking the time to share this tip with us. We are all looking for a way to cut down on calories without sacrificing taste. How much smoked paprika? I did not see the amount in list. Karim, I would add more tomatoes, it is definitely coming from the onions. What is the purpose of step 3: In a blender blend the onions, garlic, parsley, and celery, scotch bonnet pepper and basil and fresh thyme until puree? Is it meant to say puree the roma tomatoes? That’s another way of putting it too! the ekwang is just so beutiful. please i want to try it could you give me your secret of making it look just so green after cooking? Girl, there is no secret . Don’t just over-cook it. Thanks for stopping by! Hi Immaculate, I am going to try your African Beef Stew and I cannot see on the recipe when to add the “Maggie” powder. I have located several suppliers on the internet for Maggie powder but I am not when to add it while cooking the stew. It sounds wonderful and I am anxious to try it. Diane ,you add maggie after smoked paprika. I have updated recipe. By the way, you can use chicken bouillon sold in most markets. Thanks for stopping by . Let me know how it works out for you.